If you like tuna salads, you will definitely enjoy this fit tuna-egg salad. Tuna and egg go well hand in hand, but in combination with avocado and crunchy nuts, you can move this salad to an even higher level. You can customize the basic recipe according to your taste and add in, for example, pieces of celery stalks, green onion, red onion, dill, corn or pickles. There's really a lot of choices and I believe you cannot go wrong with this tasty salad. Tuna salad is packed with proteins, omega-3 fatty acids and other important nutrients, but better don't consume too much of tuna, because some tuna species contain excessive amount of mercury. So again, everything sparingly. Better reach out for more quality tuna and try to avoid the cheapest crushed tuna. 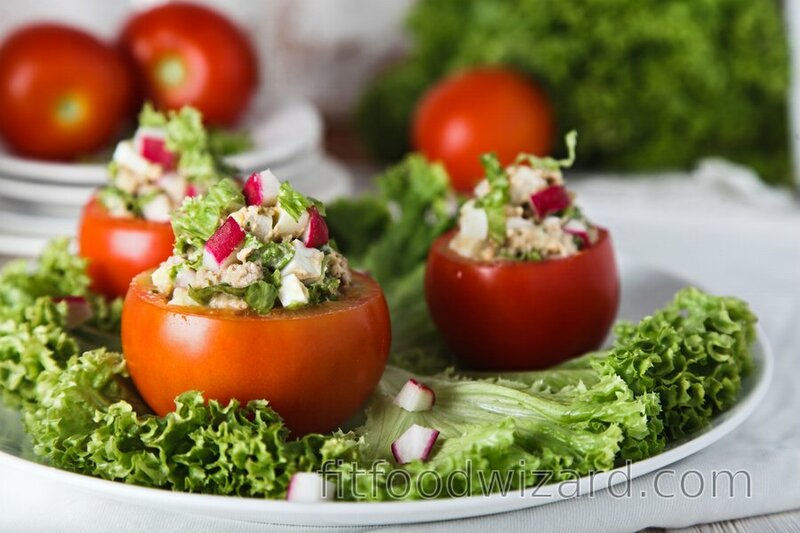 The most of all I like to serve this tuna-egg salad in tomato, it will fill you up enough, and doesn't require any bread or any other side dish. It is nutritionally valuable, packed with protein and contains only 7g of carbohydrates per serving. It goes perfectly as a light dinner or as a healthy snack in between main meals. Hard-boil the eggs in water, peel them and cut into pieces. Mix eggs with drained tuna, mashed avocado, yogurt, finely chopped radishes, salad, nuts, and spices. Cut the top of the tomatoes and remove all the seeds to make a bowl. Put a tomato on top of the salad leaf and fill with the salad mixture.